Orlando, Fla. (June 13, 2017) – A whiskered walrus baby was welcomed to SeaWorld Orlando on June 3, when a 14-year old female, Kaboodle, gave birth to her first calf just after midnight. Kaboodle and her baby immediately began to bond and the pair remain close at all times, even snuggling with each other as they sleep. Throughout her pregnancy the park’s animal husbandry and veterinary teams provided extensive pre-natal care and regular ultrasounds. The new arrival has already brought great joy to the teams, especially when mom and calf vocalize with each other. 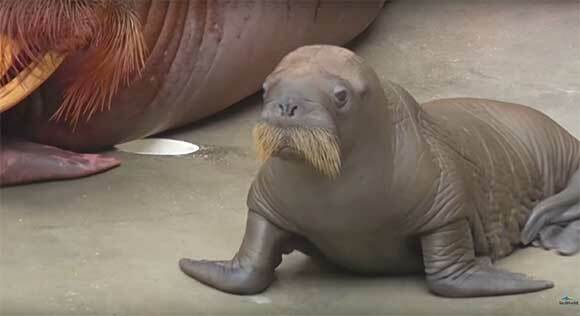 Kaboodle’s calf is the first baby walrus born at SeaWorld Orlando. Walruses are extraordinary creatures. The park’s walrus program plays an important role in educating the public about these amazing animals. While walruses are not yet listed as a threatened species, they have been affected due to global climate change. Kaboodle and her calf will soon inspire park guests to learn more about the plight of walruses in the wild. Walrus populations have stabilized since 19th century commercial hunting was outlawed, but still face habitat challenges from warming temperatures and a thinning ice pack. SeaWorld Orlando has cared for orphaned walrus calves with the permission of the U.S. Fish and Wildlife Service, and the SeaWorld Busch Gardens Conservation Fund has provided research assistance on the Pacific walrus and the impact of dwindling floating sea ice. Calves are born with robust whiskers which aid in detecting the shellfish that are part of their diet. Both males and females have large tusks that used for defense, cutting through ice and getting out of the water. Kaboodle and her calf are currently not on public display. They remain under 24 hour care with the husbandry team to ensure both mom and calf continue to thrive and bond together. Stay tuned to SeaWorld’s Facebook, Instagram, and Snapchat (seaworldfl) for updates about the adorable walrus baby.